Along the lure-making learning curve, the trout spinner is a versatile bait that’s easy to create and fun to customize for salmonids in any lake or stream. A dressed treble hook and a few components come together for an easy-casting compact lure that triggers brutal reaction strikes and covers water to help catch active fish. Employ these lures in spring or fall for stocked rainbows and browns throughout the state, and tie them up in colors that you know will catch fish. Dress up a treble hook with coastal deer hair, tying it securely on the hook shank with 6/0 thread. I’ve added a couple strands of tinsel underneath to provide some flash. (1) Hollow hairs like deer and elk will flare as you tie them in place, making the body appear bulkier than it really is. I like this effect for providing a bigger profile on the business end, while still being able to tie a compact thread head on a trout-sized treble hook. With the multitude of materials available today however, don’t limit yourself to just one dressing for your spinners; try plastic tubing, krystal flash or peacock herl along with other materials (2). Secure the materials and thread on the hook with a drop of head cement at the tie-in point. When the hook is dressed, thread it into the partially-looped area of the pre-bent .026” wire shaft (3). 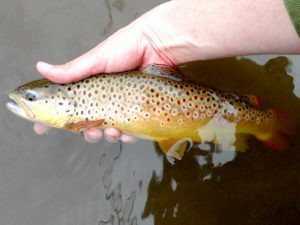 You may want to form the loop and attach the treble with a split ring if you plan on changing hooks on your spinner, as trout fishing with a treble hook is prohibited on some waters; check your state’s regulations for more information. Secure the hook (or split ring) in place by twisting the tag end of the wire around itself a couple of times and trimming with a wire snipper (4). Next, select the body segments and beads you want to add weight to your spinner. Stack them on the lure by threading them on the wire shaft (5). 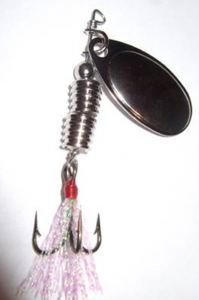 Once they are in place, you can thread a blade onto a clevis and add that to the lure which will provide the vibration and flash to draw trout in for a look (6). With your components in position, grab ahold of the wire shaft just above the components with round-nose pliers, a very fine needle-nose pliers, or a wire-forming tool, leaving just a little space for the components to move. Twist the top end of the wire down and around the spinner shaft three times, forming the tie-in point of the spinner. Cut the top end of the wire off once a secure tie-in point has been made (7). You can decorate the blade of your new spinner with prism tape or just leave it plain for a silver flash. Try a variety of materials for your hook dressing and experiment with various blade sizes when you make your lures to find out what works best on your waters (8). From this point on, you can tie spinners for all species. Smallmouth and pike will take to medium and large in-line spinners while muskies will smash those extra-large offerings with double blades and flashabou skirts. 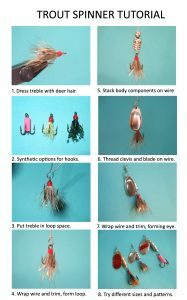 With what you’ve learned from this tutorial and through your own lure making efforts, you’ll be able to fashion a lure for any species and fishing situation.